After being gone for days I get only 4 new posts and the system says "since 1:01 PM." I was not on anytime since at least Friday. Same thing last time I logged on sometime last week. Try clearing your cookies and trying again. I assume you are using the same browser? Just tried again and my last post (quoted) showed up. Are unread entries supposed to be bold? None of mine is. Are using "View New Content" ? Yes, and I never had this happen before here. Had "six new posts since1:14 today." Where 1:14 came from I have no idea. Had not been on all day. Go to the very bottom left of the board and click on "Delete My Cookies". You will have to login again but that should reset everything. Well :censored: ! It is baaaack. I even cleared the cookies as you suggested. Had 6 pages unread on 986forum.com. I had one new entry "since 12:45 today." I was not on for a lot longer than that. 2-3 days IIRC. Can you tell me your OS, browser brand and version? Thanks - I made a few changes to your db record. Please delete cookies for this site, logout and then log back in. Give that a try. If this does not work then it has to be browser/OS related - tehn I will need to dig up an XP machine. I thought i posted this already, but maybe I did not hit at add reply button. When I logged in today I got no new posts since 1:00 PM.. Then I hit Forums and got 10 new posts since 1:00 PM. Then I followed your instructions and cleared cookies and re-logged in. No new posts, but probably cuz the cookies were tossed. I did notice in "recently added posts" that there was a posting as early as 9:something this morning. I'll try later or tomorrow and let you know the results. Thanks. Edit: OBTW I get two pages of :Active Content" over the past 24 hours.". 1 new post, but 49 active content that includes some that should have been new. Active Content is all new posts in the last 24 hour period. 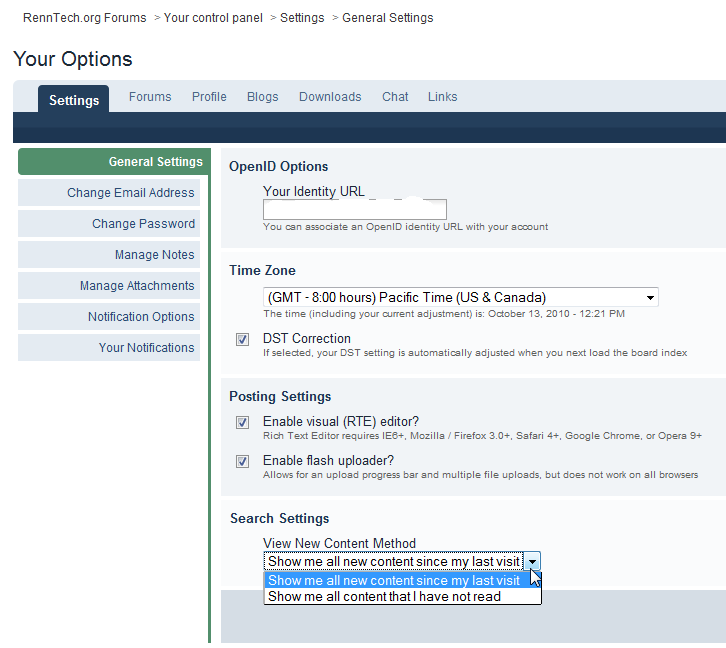 View New Content is based on the setting in your My Settings page. Mine is set to show new content since last visit. I only mentioned active content because it works. Today I had two pages of active content, (44) since about 5:30 PM last nite and only 11 new posts today since 3:49 PM today. It appears something is making my account think I log in when I have not. Let's wait for the Oct 26th update to the forms and see if this is one of the bug fixes. Check that -- give me a day or so to test the update before we do it here so Oct 28th is more realistic. Thanks, Loren. I'm not impatient. Had a page of new posts since 0749 today and a page and a half of active content.. Oddly your posts in this forum do not show up. Okay - the board has been upgraded and all bug fixes applied. Give this a try again - best to clear your browser cookies and this board cookies first. Haven't cleared cookies yet, but wanted to post this in case they are cookie dependent.